Oh man, you all, I’ve been playing a LOT of Diablo III lately.1 I’m sure that many of you who have played have been through the same scenario I have time after time. After running around avoiding AOE attacks, dashing in to rez fallen teammates, and swatting aside trash mobs, you and your co-players finally deplete some end boss’s health and immediately gather around the newly created digital corpse to answer that all-important question: did anything good drop? 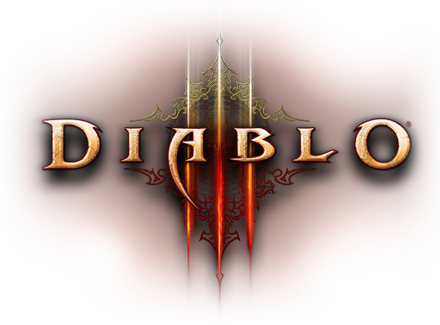 In some of the most important ways, Diablo III is a game about hitting monsters with weapons until other, hopefully better, weapons pop out of them. That is, it’s a game where you try to maximize the outputs of a system through optimal combinations of your character’s skills and equipment. This puts acquiring new gear first and foremost2 but unlike previous games in the franchise this one complicates that process by having auction houses where you can buy and sell equipment so that killing stuff isn’t the only way to deck yourself out with phat lewts. As is my habit I’ve been thinking about how different psychological theories explain our willingness to buy things in the auction house and grind for new equipment from in-game drops. The game’s developer, Blizzard, probably has two goals among others: one, to get people to spend their in-game gold to keep the game’s economy moving (or real money in the real money auction house), and two to keep us playing the game over and over again in order to find stuff the old fashioned way. In pursuit of these goals, I have three suggestions for Blizzard (or anyone else developing a similar system) based on well established psychological phenomena. Instead of dumping everything at once, I’ve split things into a series of three articles, the first of which follows. Let’s look first at how Blizzard can inflate prices in the auction house to keep money moving through that part of the conomy. 1. Is the height of the tallest redwood more or less than 1,200 feet? 2. What is your best guess about the height of the tallest redwood? What do you think? These are questions that researchers3 asked of some visitors to the San Francisco Exploratorium. Other visitors were asked a similar pair of questions, except that the first one asked whether the tallest redwood was more than 180 feet instead of 1,200. Both limits are pretty extreme, in that 180 feet is obviously way too short for the tallest redwood and 1,200 feet is crazy tall. Nonetheless, the answers to the second question, which was consistent across both groups, were pretty amazing. On average, those who had been primed by the 1,200 feet figure said the tallest tree in the forest had to be 844 feet, while those who heard 180 feet off the bat thought the tallest had to be only 282 feet. These were all random visitors looking at the same trees; the only difference between the two groups was the figure in that first question. This is a clear cut example of what psychologists call “anchoring,” one example of which is presenting us with a number to change our estimates of an other, possibly unrelated number. Simply seeing the numbers 1,200 or 180 caused people to anchor on that number and to then adjust their estimates of the tallest tree instead of picking a more sensible starting point. This kind of effect shows up everywhere once you know to look for it. It’s the basis of lowball sales pitches that get you to anchor on a low price and then negotiate up. It’s the reason why many fast food restaurants list bigger, more expensive drink prices first on their menu. It’s why the “But wait! There’s more!” brand of infomercials list absurdly high prices for their wares first before slashing them down for a limited time if you act now. 2 bajillion gold for a rare two-hander? Pffft. I won’t pay over …half a bajillion. And anchors can still have an effect if they’re nonsensical or random. Behavioral economist Dan Ariely and his colleagues conducted a study4 where they used anchoring in an auction simply by having bidders write down the last two digits of their social security number at the top of their bid sheets. Those whose numbers ended in the 80s and above actually were willing to pay up to 346% more for things like wine and chocolates than were those whose social security numbers ended in the 20s or below. This is why I think that if Blizzard wants more money spent in the auction houses, one way to effect this is to pre-sort the buyout prices so that we see the big fat numbers first in our search results. Even absurd ones like where that one numbskull obviously just held down the “9” key for 30 seconds. Seeing larger numbers will prime us to inflate our estimates of what that item is worth to us. If Blizzard wanted to get really sly about it, the company could show you the most that an item5 has sold for over the last 7 days. Of course, savvy auction house shoppers can use this information to avoid the anchoring effect. Setting price limits in the auction house filters would mitigate it, for example. Me, what I typically do is set some price limits with the filtering tools, then sort by ascending price rather than descending. That way, I anchor on the low prices instead. But what about getting loot the old fashioned way –by grinding for it? Read about that in part 2, or skip ahead to a discussion of what effects the auction houses have on dopamine rushes and loot hunting in part 3. Finally, there’s a bonus part 4 about the effect of item history on auction house prices. 3. Jacowitz, K. and Kahneman, D. (1995). Measures of Anchoring in Estimation Tasks. Personality and Social Psychology Bulletin, 21, 1038-1052. 4. Ariely, D., Loewenstein, G., & Prelec, D. (2003). Coherent arbitrariness: Stable demand curves without stable preferences. Quarterly Journal of Economics, 118, 73-105. 5. Or similar item, given that attributes vary a bit across items with the same name. Blizzard actualy does something comparable in the auction house for gems and crafting materials, where they list the average price of the last 100 auctions of the same item. While probably not used to prime but to inform, the tools are there. Seeing as the items of Diablo are randomly generated (only the names of the legendaries aren’t randomly generated) it’s somewhat harder, but it should be doable to make a system where you can get an estimate of what an amulet with +100 strength should sell for. I’ve actually seen a demand for an option like this in forums such as NeoGAF. You can search for items with roughly the same parameters as the item you want to sell to get an idea of how much you should charge, but that is the only way. It would be easier for the user to get an automated estimate of what items of equal strength sold for in the past. Then just add a column for the maximum sold value next to it for anchoring purposes. That’s a good point about the commodities auction house. It’s not perfect given the random nature of the attributes, but an estimate on that combination of item type and item level could still be informative. I really wish that they would open up their APIs so that someone could do mods like they did for the World of Warcraft auction house. I have no idea what to price my sales at. OOH! That makes me think of another example of anchoring in the AH. When you list an item for sale, it automatically fills in the min bid price with some low number –vendor value price, maybe? We probably anchor on that low price when setting our auction prices. If they listed a higher number there, people would probably anchor on it and raise the price of both the min bid and buyout prices. Yeah, that low price that is automatically filled in is the amount you fetch when sold to a vendor. I can actually attest to that working. When I sell something that has a scrap value of 5000, I usually up the starting bid to somewhere like 10000. If the scrap value is around 10000, I up it to 20000. Reading stuff like this is so enlightening for me. I’m one of those people who are cheap as all hell. I don’t care what numbers I see on product, I usually have a limit in my mind of what I would ever spend, at most on that item. Friends know that I carry this penny-pinching attitude into my games. It’s hard to believe my behavior is rare. Now I don’t always get great benefits for being cheap in games, but the main one I get is to have more money to spend on things I’d literally want to binge on. In WoW, that was mainly gray items with awesome flavor text (such as this item: http://www.wowhead.com/item=36805). I suppose it had the same relative value to me as a sword would another player, but …yeah I’m just cheap. Part of my psychology is I don’t trust markets. I’m not really willing to trust the price or quality of a product, especially with things like gear on an auction house. The value is apparent and the player gets to weigh that against other parameters (“I’m level 52, should I spend 2 mil on a belt?” etc.). I’m not even attempting to dispute your findings. I’m just simply amazed everytime I read stuff like this at the behavior of gamers. Great stuff and looking forward to the follow ups. Pingback: Toilet Reading: The First Splashdown | Where Does Godzilla Poop? Nice articles. I’ve read through 1-4, and I’m interested in learning more about the psychology of loot. I also read your article “Psychology of Looting” which referred to drops in World of Warcraft. I’m wondering if there’s something to be gained from analyzing the probabilities of payouts from slot machines and applying the same or similar numbers to drop rates in video games. But that comes with at least one problem I can think of: jackpots are rare. Developers want players to enjoy playing games (or get hooked, as the case may be in ‘addictive’ games like World of Warcraft and the Diablos). This may or may not mean giving the experience of jackpots. At the very least, there should be payouts along the way in a gamer’s playtime that keeps them playing. World of Warcraft excelled in this regard. Quest turn-ins, the occasional blue or purple from mobs, and discovery of gathering nodes all come to mind as ways that Blizzard implemented payouts. But did they do so in the most optimal way? I think it’s pretty obvious from the addiction problems of gamblers that the payout systems of slot machines are effective at keeping players hooked. I’m just wondering if any game developers have looked into the raw numbers in payout probabilities of slots and applied them to their games (I anticipate some google-fu is in my near future). There may be something to learn from that, insofar as developers want to their gamers to keep playing. There was a forum game I played years ago that had visual based avatars that you could dress in different items, from common to extremely rare. They also have an AH similar to Diablo 3’s. 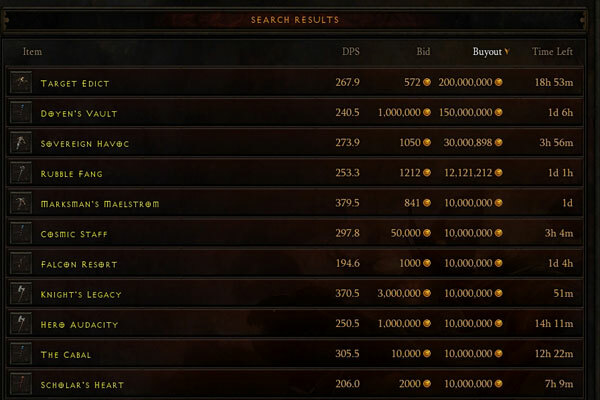 Something they have that I think D3’s AH should have is a front page where you can see different things such as a marketplace snapshot of gold flow through the economy, rising/falling trends in items, popular affixes, as well as the recommended items that is already shown when you open the AH.